Items on this page are only sold with the purchase of a door. 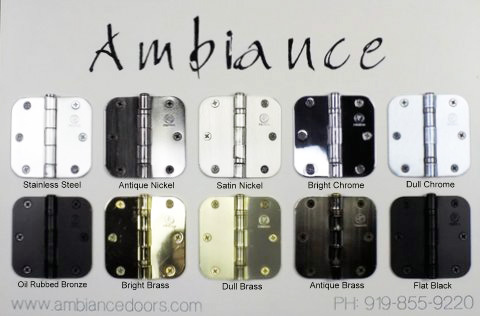 Replace your old warn out squeaky hinges with new beautiful long-lasting hinges. Standard 3-1/2” x 3-1/2”, 5/8” radius corners, heavy duty residential ball bearing hinges with matching wood screws. Set of 3 Hinges like above with matching screws. Door Stop - Rigid 3"
Door Stop - Spring 3-3/4"